What is the Australian Council for New Urbanism (ACNU)? The ACNU represents an alliance of Australian and New Zealand practitioners, who are working together to improve the quality and sustainability of our urbanism. Australian New Urbanism is a growing and evolving practice, with strong values and on a steep learning curve. Its basic aim to improve the urban sustainability, vitality and quality of life for existing Australian towns and cities, as well as for new urban extensions. 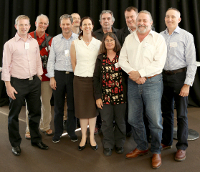 Primary tools include design, regulation, development and education, at all scales from buildings to regions..
ACNU, in conjunction with PIA, ran a one-day seminar in Penrith, NSW, on how to produce good small lot housing. Downloads of all the presentations are now available by clicking here.